It is September. The lazy days of summer are starting to wane. For many of us school beckons once again, and we can't help but think to ourselves, "Summer went by too freakin' fast!" 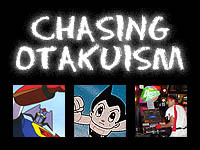 So what's an otaku to do? Well, we can understand your sad predicament. To better prepare you for the coming months of mindless book work, we've put together an issue that will be more distracting than ever before. We expect the nation-wide grade-point average to flounder into an unusual slump due to our September issue. So come, take part! Put down the homework, break loose the shackles of academic oppression, and proudly put on OUR shackles of sheer Animefringe goodness. Thanks to the wonder of the Internet, being broke is no longer an excuse to not read manga. Unless you've been living under a rock for the past few years, you'd know that online manga has picked up the momentum of a runaway freight train. You now have a gaggle (that's right, a GAGGLE!) of comic strips, manga series and even animated shorts to choose from -- all with that independent flavor we've grown so fond of. This month, we start a new miniseries of articles, showcasing many popular manga sites and their creators, and opening your eyes to the wide world of online manga. You know those series about wacky aliens that come to Earth and cause havoc for some unsuspecting family, right? 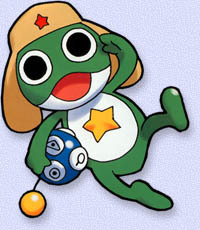 Well, add Keroro Gunso to that list. It's one seriously warped series about a race of alien frogs that have their eyes set on invading Earth, but some kids discover their plan and the next thing you know there are a bunch of frogs sponging off people. Add in a ton of anime references and you've got a manga that's one part Otaku no Video and one part Urusei Yatsura. 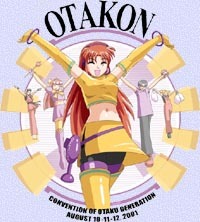 Some say that Otakon is the East Coast equivalent to Anime Expo, the biggest West Coast Anime Con known to date. Anime Expo has it's favorable moments, and sometimes even lack of such, and Otakon has theirs as well. Let's take a step back in time to early August, where the fun began. 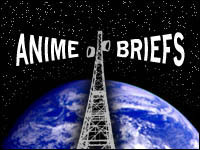 This month's hefty batch of Anime Briefs is enough to satisfy even the most insatiable hunger for late-breaking anime news bytes. 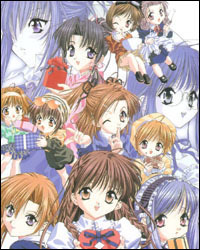 Everything from news of an upcoming Love Hina Game Boy Advance game, to the Final Fantasy: TSW DVD release, to exciting news about a new Sakura Taisen project by Sega Enterprises -- and much more!